This bright 66" x 66" quilt is made with Marabella fabric from Henry Glass (designed by Amy Hamberlin). 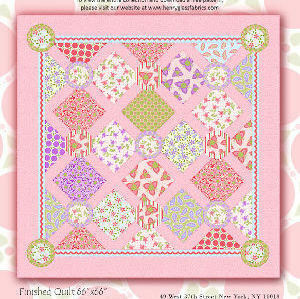 With fun, bright colors perfect for summertime, this adorable quilt is perfect for the cute little girl in your life. 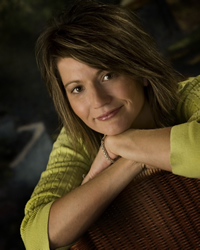 My name is Amy Hamberlin I live in Rigby Idaho and have three beautiful children who keep me running! I love to sew and create. I also enjoy the outdoors--especially gardening (in the flowers preferably). I love life and love to enjoy it. I starting quilting when I was pregnant with my daughter (now 5 years old). I stumbled onto a quilt shop in Utah and thought I had died and gone to heaven! I bought everything I needed for my first project, which was a buggy barn pattern (heart crazies) and took it home for my mother-in-law to help me get going. She had made several beautiful quilts and I was sure she could help me get started. Most of you probably know that a stack and whack isn’t a traditional quilt technique by any means. She looked through the pattern and handed it back to me and said good luck! She had never done a stack and whack. I said, “well, can you at least show me what a quarter inch seam is?” She did and I went to work. I finished the quilt in just a few days and was ready for more. It was so much fun! Six months later I opened a quilt shop. I started designing projects for the shop and a couple years in I decided that designing was my love. I have now started designing children's clothing And just released my first fabric line Marabella with Henry Glass. My next Fabric line Genevieve will be available October 2010! To see more of my quilt designs go to www.katicupcake.com. I have 2 favorite patterns. The first one is called "My Favorite Bag." 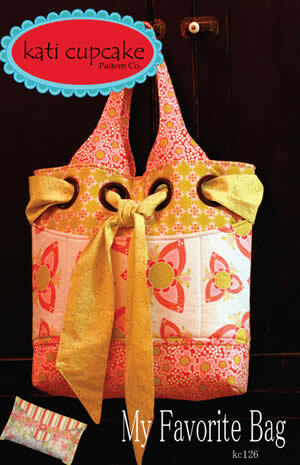 This pattern made it to the top of my list because I love the versatility of big chunky bags. They're great if you have little kids and for just about everything else too. My other favorite pattern is one I just designed so it hasn't come out. But you can check it out on the cover of HomeSpun magazine's November issue. My family and I really like outdoor activities. Watching baseball, shooting hoops or challenging my son to a round of golf are some of my favorites. But sometimes the best way to relax is just hanging out at a park or doing some yard work. Before I started quilting I became close with my husbands grandmother (a long time quilter). Over many years she had made blocks from important phases of her and her children's lives. She showed me blocks from prom dresses and many other life events using silks, cottons and fabrics of all kinds. Walking down memory lane as she explained each block will always be dear memory. This bright 66" x 66" quilt is made with Marabella fabric from Henry Glass (designed by Amy Hamberlin). 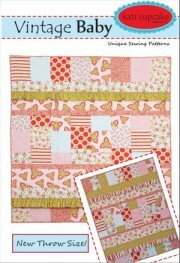 With fun, bright colors just right for summertime, this adorable quilt is perfect for the cute little girl in your life. Do you like Amy's designs?